I know I mentioned the weather last month, but we have had no rain in July bar a day of windy drizzle towards the end, after none in June. The muggy heat in May that turned into serious heat in June and an actual heatwave in July has really caused the garden to suffer, particularly as we only water the vegetables and plants in pots. It is a struggle to keep the vegetables hydrated enough to survive, but so far the only crop that is thriving in the heat is the courgettes. The raspberries were early, small, and dry. After I picked the first ripe ones the next flush simply dessicated on the plants without ripening. Our soil is like dust, and to a depth of at least 30cm, so it is a mystery to me how the shrubs can stay alive in such circumstances. I have lost many plants in pots that I have simply not been able to water often enough to survive. We have had to top up the pond several times as the water level goes down from several causes - all the wildlife come to drink from it and bathe in it as well as water loss from evaporation and the plant life in the pond. We try to top up with rain water to minimise disruption to the pond water ecosystem, but the waterbutts are not getting refilled. Enough complaining, let's turn back to creating the pond. In order to determine how deep to dig the pond we needed to determine what plants we wanted in the pond. Naturally our first thoughts were of water lilies. This was a bigger pond than we had had before, so we could have a more expansive water lily. This meant the pond needed to be about 1m deep. This took SOME EFFORT. In fact it was very difficult, as the hole shape and size meant that spades couldn’t be freely wielded, or indeed pick axes to loosen the soil for shoveling out. Soil had to be shifted into buckets and then carried to wheelbarrows and barrowed to the storage bags in the orchard. Slow and hard work. 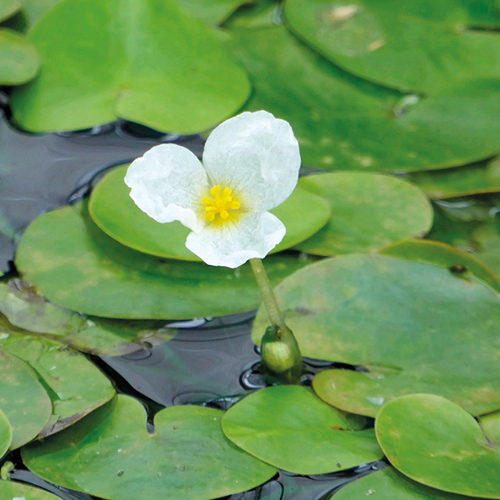 Another floating plant I wanted was Frogbit – Hydrocharis morsus-ranae. Beguilded by the description – it looks like a baby water lily with three petalled white flower – how could I resist, and it is an oxygenator, and native to Britain. I believe I still have it in the pond – I have chucked bits in twice now, but whilst I see the leaves occasionally I think the Water Soldiers are preventing it spreading much. 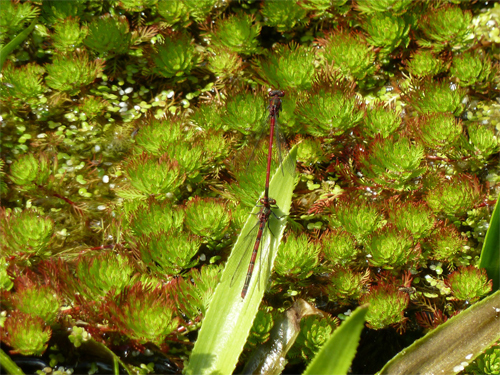 You can probably see in the above photo another of my floating plants – duck weed (Lemna minor). I promise I didn’t plant this, and indeed for many years we didn’t have any, but some passing bird must have come for a drink or a wash and left us this present. Now, I shall quote Stefan Buczacki who has a soft spot for duck weed - “As a child it was because of the pleasure I gained from seeing frogs poking their heads through its light green, all embracing carpet. Since, I have admired it botanically as one of the smallest of all flowering plants, with each tiny frond or thallus being a complete individual.” Hmmn he does also admit it spreads a lot, and that once you’ve got it, you’ve got it. So it is another plant that gets removed regularly. On the plus side, it is covering the surface of the water which does help to keep the blanket weed down. In terms of plants planted in the depths of the pond, initially there were two:- Pontederia cordata – Pickerel weed - to give blue flowers late in the summer, and Water Hawthorn – Aponogeton distachyos. I expect you are all au fait with pictures of TV gardeners in waders carefully stepping into their ponds and lifting in or out aquatic pots of plants. If you think of our shape of hole, this is not much of a goer – so this is how we attempted to plant the pickerel weed…..
By the way, have you noticed – no waterlily? We are still thinking about which one, and whether all the wildlife will like it!! 0 Comments To "On a Chalk Hillside August 2018"